Everything in Resolume is controlled by parameters. Parameters come in a number of shapes and sizes. First and foremost we have sliders. Sliders enable us to set something to a specific value. For instance, the Scale of a clip is a slider. To use a slider, click in the slider area and drag the value left or right. If you want to set a parameter to a specific value, click the numerical value, type in the new value and hit return. Tip! When dragging a slider, Dingetje will pop up. Dingetje is Dutch for "Thingy" and Dingetje is useful to quickly enter a numerical value. You can also click on the left and right arrows on Dingetje to increment and decrement the value by a fixed amount. Yes, Dingetje is really how we refer to this UI element, both in the office as well as in the code. You can also do math when typing values. 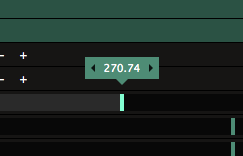 So for instance, if you want to set the X Position of a clip to exactly one third of 1920, simply type "1920 / 3" and Resolume will do the math for you. If you knew it was 640 without getting a calculator out, you've been a VJ for too long. Some sliders are compound sliders, which means that they expand to reveal more sliders. For instance the Rotation slider, which by default rotates the image around its center, expands to reveal Rotation X, Y and Z, for full rotation across all axes in 3D space. You can set a slider back to its default value, simply right clicking on the slider or parameter name. Toggles can be used to turn something on or off. The big B and S buttons on the layer are toggles. They both control the visibility of the layer. B is Bypass or Blind, and turns the layer off. S is for Solo and turns all other layers off. Every effect also has it's own bypass toggle. You will also see toggles as little boxes that can be ticked. For instance, the Flip effect has toggles for Horizontal and Vertical, which control which axes the image is flipped across. Events are buttons that trigger a certain action. The big X on the far left of each layer is an event button. When you click it, it will eject the currently playing clip from that layer. After that, it goes back to being a pretty little X, waiting for you to press it again. Occasionally, you will come across an event button in an effect as well. For instance, the Cube Tiles effect has an event called Randomize, which randomly re-arranges how the tiles are distributed across the cube. When you get right down to it, clip triggers are also sort of event buttons. Or are they toggles? Hmmm. This makes my head hurt. Some buttons are grouped together. These are called "Radio Buttons". A group of radio buttons can only have one button active at a time. When you click one of the options, the others will automatically be deselected. This is how radios worked in, like, the 1940s, so that's why we still call them radio buttons. Because we're old. A good example are the playhead controls for a clip, which let you set if the clip plays forward, backward, is paused, or jumps to random frames. Another example is the Autopilot for every layer. Dropdowns will reveal a list of possible choices and let you pick the one you want. The Blend on each layer is a dropdown with a huge list of choices. Like, crazy long. Also, a clip can be switched to a number of different playback modes via a dropdown. Color is a very important aspect of visual performance. Maybe the most important. Resolume gives you fine grained control over color. Wherever color is used, Resolume will show a special UI item to set it. The default view is a standard color picker. Simply move your mouse to pick the exact color that feels right to you. If you're more of a number person, you can also set the the color using RGB or HSB sliders. In these mode, you can get the color you want by entering the exact Red, Green and Blue, or Hue, Saturation and Brightness values. 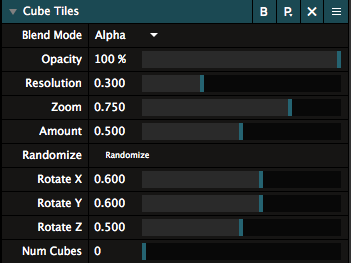 Using sliders gives you the added advantage of parameter animation, and an extra slider for the alpha value. A Color parameter also has the option to show a Palette. On a Palette, you can keep a range of your favorite colors. If you want to add a color to the Palette, simply drag it from its preview to an empty swatch on the Palette. By right-clicking on a swatch, you get more options to remove a single swatch, all the swatches, or update the swatch with the current color. Parameters can be automated in a number of ways. You can read all about this in the section on Parameter Animation.